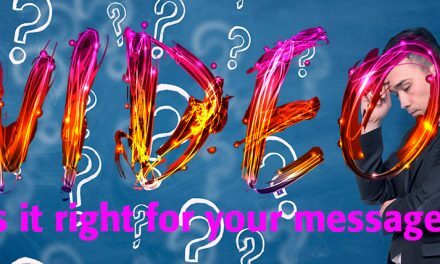 Now that you’ve spent time and a bundle of $$’s creating a great video you’ll need to use some savvy tactics to ensure your content will drive traffic to your website or blog. This YouTube Video Marketing Tips post is the first in a series. Video Marketing Tips for Facebook, Twitter and Email will follow soon. YouTube is the obvious place to start your video marketing for three big reasons. First, as a part of Google, YouTube videos are favored in search engine results. Secondly, YouTube is a free video hosting platform, and third — YouTube is right behind Google in search engine use. Here are our seven actionable tips that will help your video content attract viewers and deliver web traffic. 5) Tag lots & lots! 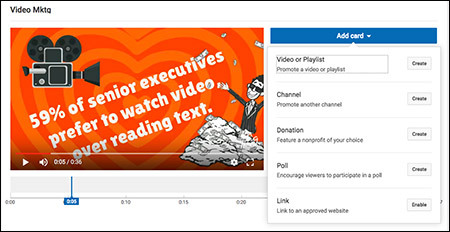 Video Thumbnails are the small, clickable images that visually represent each video. Thumbnails are generated automatically when YouTube processes your video. YouTube offers you three choices of frames from the video, and I have yet to see an engaging auto-generated thumbnail. 1. Your image should closely reflect the first 10-15 seconds of your video. A viewers tiny attention span begs a seamless experience. Don’t leave them wondering what video they are watching. This Grant Cardone thumbnail is a great example of evoking an emotional response by pairing with the first four seconds of his video. 2. Use close-ups of faces whenever applicable. Viewers are drawn to emotions. This video of a soldier reuniting with family is sure to bring a few tears. Put human psychology to for work for you with compelling close-ups in your thumbnail. 3. Create visuals consistent with your brand. Videos are another opportunity to build brand awareness. An example can be seen on the YouTube channel for The Mental_Floss. A conscience brand decision delivers thumbnails with consistent text treatments and graphics. This branding assures viewers about what you can expect. 4. Don’t put text or important content in the bottom right-hand corner of a YouTube thumbnail. That area is used for the video time stamp. Those rules are pretty simple. Now creating the thumbnails is another matter. My first encounter with YouTube’s “custom” thumbnail instructions turned me off as just too complicated for the average marketing creative. One goal of my blog is to offer solutions that won’t require expert skills. So I went to Canva.com, the freemium design app that anyone can use to create anything graphic. And yes, you guessed it, their tools include a custom YouTube thumbnail creator. So if you aren’t on board with Canva.com open your free account now and go to their custom YouTube thumbnail creator. Canva offers a quick tour which shows you how to use their drag-and-drop editor. 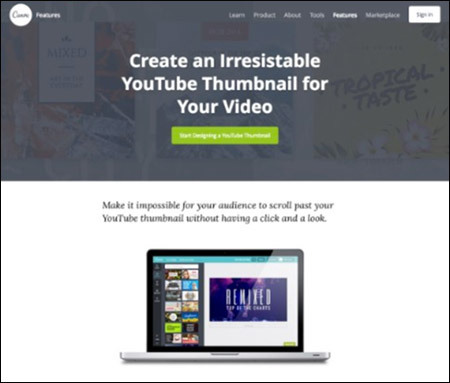 YouTube thumbnail creation can’t be easier with Canva’s pre-designed templates. Even creating a custom thumbnail from a blank canvas is easy with all of the available Canva graphic elements. As with everything Google, there are a few steps to take before you can upload your custom thumbnail. 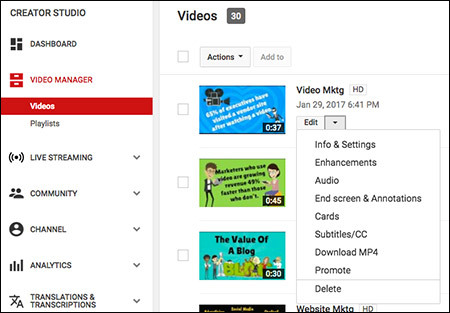 Of course, there is a video showing how to upload your custom thumbnail to YouTube. All great content starts with a great headline and video is no exception. A video title carries the same weight as a headline. There are many great blogs about writing headlines, and the best ones are from writers. We will not pretend to have their expertise but, we will suggest a great headline analyzer tool that determines the emotional marketing value of your headline. It’s more than useful; it’s great fun too. Our next tip number three may not be for everyone, but it is not as difficult as it may seem. You’ve probably seen the annoying clickable bubbles, blurbs, and boxes that float above videos as they play. That engagement element is called Annotations element is being replaced by the YouTube Card. The cards are viewable on desktop and mobile which is an improvement over annotations. You use the YouTube Card to inform viewers about other videos, merch, playlists, websites and more. The Card is another engagement element and one more way to drive traffic to your website or blog. To add a card to your video, first, login to YouTube Creator Studio. Then use the drop-down arrow next to “edit” to add a card. Next, you will choose when you want the card to appear and the type of card you want to use. Currently, you can add up to six types of cards to a video. 1. Video or playlist to promote your other videos. 2. Channel to promote another channel. 3. Donation to encourage donations to non-profit organizations. 4. Poll to ask your viewers a question, get their responses, and then provide the results instantly. Polls are useful for asking about your audience pain points or what information they would be interested in. 5. Links to approved websites. Like most things YouTube, directions for adding Cards are easy to follow. A contextual end screen is a form of advertising that is relevant to the page’s content. End screens are built with elements like text, images or other videos which you place on a grid. YouTube even offers templates to create End Screens. YouTube provides easy to follow instructions for building End Screens. You might think of a Tag as the YouTube equivalent of a key word. It is similar to but distinct from HTML key words. Tags are used to determine what your video is about just like key words in a web page description & title. Tags are needed if you want your video to appear in search results but are not visible to viewers. You probably don’t want a nerdy description of what tags are, but if you are interested, here is Google’s description. Tags are about search engine optimization. SEO is one of my favorite subjects and an important part of our business. Good internet marketing starts with seeing what your competition is doing to rank well in searches. Before starting any website development, we audit competitor websites. The cool thing is we can audit competitor videos too, so I just can’t resist sharing another nerdy trick. In Chrome or Firefox just type “view-source:” (without the quotes) before URL address of the video you want to audit. 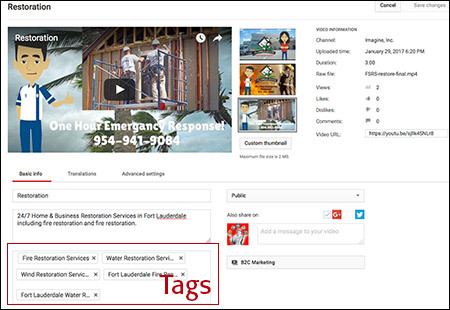 View this five-minute step-by-step video about the four categories of tags and how to add them. 1. Specific Tags – One-word descriptions of the content. 3. Generic Tags – A higher-level descriptor of the type of content you’re offering. 4. Misspellings – Very clever way to compensate for human error. The tutorial link takes you to the YouTube channel of Derral Eaves who has other videos you might be interested in viewing. Another good tutorial is “How to Rank #1 in YouTube (Fast! )” by Brian Dean. Be careful; it’s easy to get hooked on subscribing to video authors. Use Google Translate to tag your videos in another language(s). (https://translate.google.com/) Translated tags are good marketing if your audience is multilingual or you want to reach a foreign market. Google Translate results are not always the best, but it’s safe to use for tagging simple words and phrases. The Search Engine Optimization potential for YouTube videos is huge. Because YouTube is a part of Google, videos often garner prime real estate in search results. Just like good website SEO, optimizing the description is all important. I mentioned the SEO video by Brian Dean a little earlier. Brian also wrote a blog post about optimizing YouTube videos. Or go straight to Brian’s website and get his ultimate guide to YouTube SEO. 1. Put the link where you want to send traffic to at the beginning of your description. 2. Place your target keywords within the first twenty-five words of the description. 3. The length of your video description should be at least 250 words. 4. Your description should have your keyword three to four times. Applying Search Engine Optimization is an art, but if you choose the best resources to learn from that is a smart start. If you are just starting to use YouTube for video marketing be sure to read what Google has to say about YouTube Analytics. Measuring results is a critical of all marketing and YouTube offers a slew of reports. These reports are great tools to help you improve your videos and use them to prove the value of video marketing to management. Imagine, Inc. works with companies to develop a video marketing strategy that is in alignment with their business strategy. We can guide you through the process and/or execute any part of your internet marketing. Let us help you learn how to use YouTube to get the most out of your videos and drive traffic to your website. Call us at 954-257-7066 and see how seamlessly we work with you and your staff. NextRespond to negative reviews with humor.